10am - We on The Team are on a count down to September 23rd. So, you are likely wondering just what is happening on September 23rd that is sooooo important to require a count down? Well, as my Grandmother used to say, "That is wait and see pudding." Are you patient enough to wait and see? We on The Team believe that it will be worth the wait! In the meanwhile, we are The Team are in the "preparation" process. There is a lot of hustle and bustle at #309 at Guava Gardens. Doing all that needs to be done. There are little piles of stuff all over the floor. Part of the preparation. Of course, I cannot tell you what the little piles consist of. Otherwise, you would know! Right? Mac Air is over at the Apple Store in Fashion Valley [San Diego]. Mac just stopped working last week. Did I tell you about that? Not sure. Anyway, Mac got working by slamming it down on folded towel placed on a hard flat surface. By golly!! Mac started working! We have one of Apple's "Time Machines" which backs up every couple of hours. So, we did not lose any data! In the pic below, is George in the Apple Store in Fashion Valley. 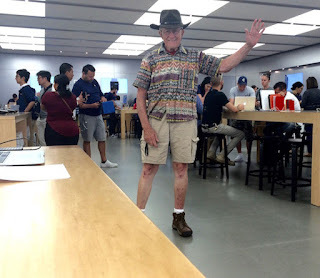 It appeared that George is about 2 to 3 times OLDER than anybody in that Apple Store. Incredible! By late evening, I had not eaten supper yet. I spent a horrid amount of time with Ebay support attempting to fix a sign on problem. So, here I am at almost midnight at Denny's. First I had a cup of chicken noodle soup. Not bad! I'm thinking about "Slow Cooked Pot Roast." Did you know that Denny's was started as Danny's Donuts in Lakewood, California in 1953? Come a long way since then. My server is taking her time making the rounds. I don't see her pass my table much. Never mind. I am busy computering. You may be aware that I get a kick out of Blogging at a restaurant table. And I do not have a clue why that is so? Hmmmm? I believe that it's been a long while since I clued you in on the Impatien flower garden. Those flowers are doing sooooo well! Must be my green thumb kicking in. Whatta you think? The tiny waterfall is able to be on all day long, even for many days, and not lose water by leaking. That Rust-Oleum leak seal stuff is a wonderful product! My good friend, Pete Olson introduced me to a very neat tool. There is a pic of this tool below. Do you know how this tool is used? Little piles...sounds like you're sorting for moving: Donate, Sell, and Keep piles. Hopefully you've heard from the SKPs park that you've been accepted and can move in ASAP like Judy Bell. That would be great. I'm pulling for you, George, and excited for your new adventures. It's good to hear your Time Machine worked. Mine is on the go all the time but I've never had to use it since I switched to Macs 6 years ago. I have a feeling about your Sept 23 but I won't say. Were you able to get out of the Apple Store without making any new purchases? I find that hard to do. Yes! That Time Machine is a real life saver! No, I left the Apple Store with an iPad Mini 2. George - Is that a miniature cheese slicer...? Oh my God!! The first answer is the correct answer! Friday, September 23rd has something to do directly with your new close friend Trayler. Am I at least warm in my guess? The cheese slicer looks just like a pack of small dental floss holders the orthodontist gave my granddaughter to use! That's what I thought it was! Love your blog George. I was raised in Bishop, California, know where that is?? Now 71 and living in Central Texas for 48 years! Pat, dental floss holders are what I thought, too! I keep one of those in my pocket on a regular basis to use after meals, and they are not as difficult to use as regular floss. 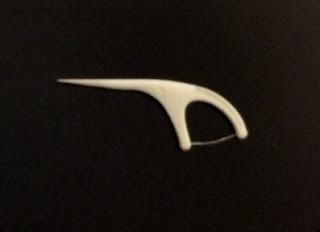 Hee, Hee, I too, thought it was a dental floss "thingie" as the angle of it in the photo did not look big enough for a cheese slicer - aren't they the neatest things to use? "DenTek Triple Clean Floss Pick." Click Here to go to the DenTeK web site.